A good thread choice can make all the difference. Sometimes it’s only there to hold everything together. But when you’ve got free rein, is it worth making that necessity into a feature? Christmas projects often send me into confusion. I love the fun side, all the over-the-top sparkly stuff. That said, simpler Scandinavian-style designs are just so charming. Having decided to finally make use of a cute Christmas tree print fabric I picked up a couple of years ago, this was exactly my dilemma. Should I keep it neutral and chic, or dress it up for the holidays? 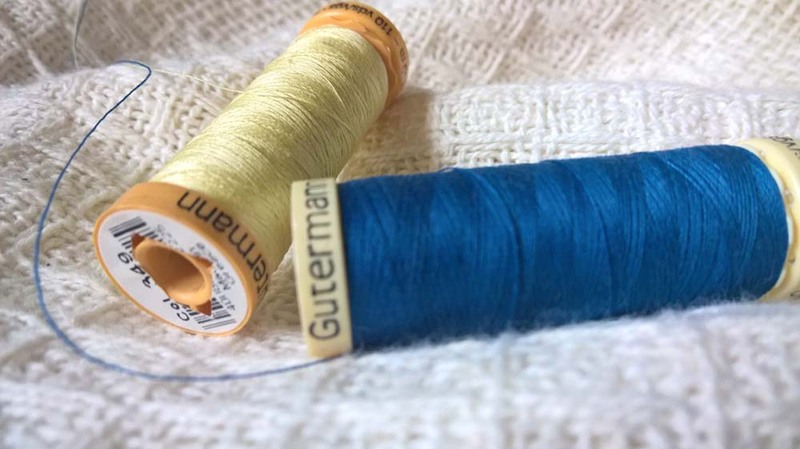 There are plenty of reasons to hold up your fabric to the Gutermann chart in search of a near-perfect match. – Invisibility cloak. Yes, those well-matched stitches hide a multitude of wobbles. – Simple can be beautiful. Sometimes you don’t want a distraction. – It’s straightforward. Just match up and get stitching. – It’s very practical. And that can be a good thing, or it can leave you feeling like you’re missing an opportunity. Faced with all the delights of closely matched thread, why plump for contrast stitching? Sometimes it’s just the default choice (jeans don’t look quite right without a flash of yellow), other times you’ve got to do a lot of pairing up before finding exactly the right effect. But I’m always surprised by just how dramatically a different thread colour can transform a make. – It’s a detail in itself. You can make an otherwise plain dress or cushion into something more complex, a little bit personalised. – Stash-busting credentials. Got the fabric but not an exact thread match? No problem! – Tie it in. If the colour you’re using for another detail just doesn’t look natural, tie it in with contrasting thread elsewhere on the project. – Hello, mistakes. Contrasting thread will let the mistakes shine, which is fine if you’re confident and/or handy with an unpicker. – Too much flexibility? Sometimes you don’t need the hassle of an extra decision to make. 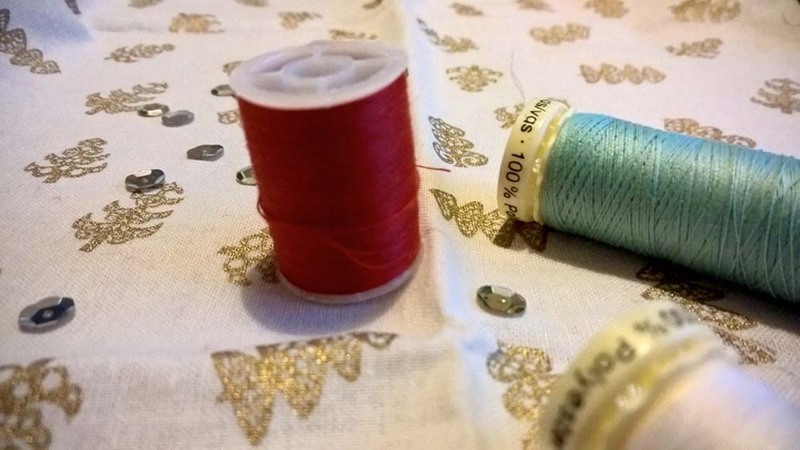 If you’re anything like me, your choice might be influenced by whether you’re starting a totally new project or working with stash supplies… because there are times when I just want to get started right this moment, and I’ll find a way to make it work. The matching thread’s already in my sewing box? Excellent. It’s not? Hmm, time for a re-think. 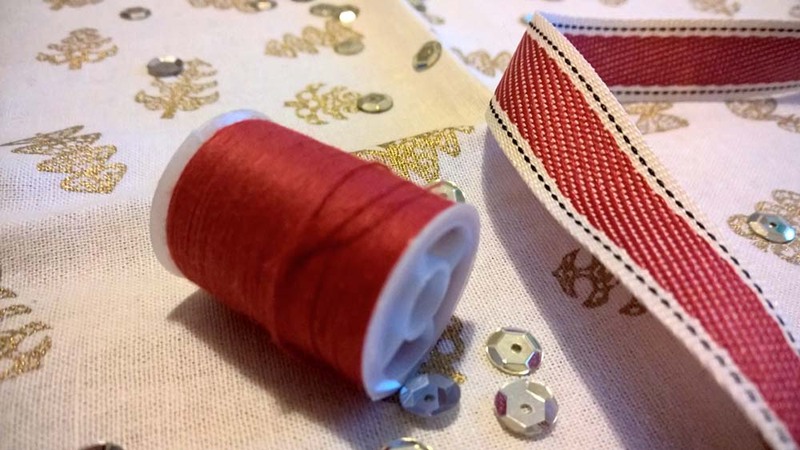 Both options are pretty feasible for this project, but I’ve decided red stitching will brighten up my cream and gold fabric and make my ribbon trim look totally at home. Add a couple of well-placed sequins and it should give my mini-projects just enough Christmas cheer. What do you think? Jane grew up in a craft-loving household, and since then has worked with some wonderful designers and makers. Today you'll find her writing about craft and culture (when she's not got a needle and thread or a crochet hook in her hand). She loves nothing more than curling up in front of a film with a project to work on and a hot chocolate to sip.